As you probably know, the products of the Chinese giant telecoms company, Huawei Technologies, are causing a lot of concern. First, the company has been accused of creating 5G mobile telephone products that are deemed a national security risk and the sale of these products has been blocked in the United States, Australia and New Zealand. Canada is reviewing its trading relationship with Huawei and the United Kingdom is under pressure from the United States to do likewise. The governments of the three blocked-product countries say that, in the event of a future political disagreement, Huawei’s 5G products could be used to disrupt communications or conduct covert espionage on a nationwide scale. In a world where everything is now connected to everything else via the Internet (the Internet of Things), he who controls the Internet controls everything. Hence the concern about Huawei’s communication products. “They may be clever, these Chinese, but can you trust them?” asks the Yanks, Aussies and Kiwis. More recently, Huawei’s Chief Financial Officer, Meng Wanzhou (daughter of Huawei’s founder, Ren Zhengfei) has been detained at Vancouver airport by Canadian authorities. This was done at the request of the United States while she was in transit. Ms Meng is now under threat of extradition to the United States. The charge has not been stated but is widely speculated to be associated with Huawei’s alleged trading with the Iranians which the Americans claim to be a violation of the current US trade sanctions against Iran. All this is taking place against a backdrop of an escalating trade war between the United States and China triggered, in part, by Donald Trump’s desire to bring back manufacturing to the USA by imposing huge tariffs on Chinese imports. But, actually, I am the root cause of all the problems between Huawei and the rest of the world. Let me explain. Before I retired, I was an electronics engineer, qualified in a special subject called Design-For-Test (DFT). I lectured extensively on the subject all over the world. In layman’s terms, I helped electronics designers in all types of electronics companies to design products that could be tested adequately in a reasonable amount of time before they were put into use. This meant adding extra bits and pieces into the hardware design of the product to facilitate internal access for test purposes – a bit like adding a dipstick to check the oil level in the sump in a car engine. These extra bits and pieces did not make the design work any better (the same as a dipstick does not make a car engine more efficient) but they did allow test engineers of electronic products to carry out testing to higher levels of quality assurance – in other words, I helped designers of electronic products design better products and some of those designers worked for Huawei Technologies. Huawei was one of my customers so the fact that their products are much sought after is all down to me! I recounted the story of when I visited Huawei in Shenzhen, China, in my book, “On One Occasion”… Ivory Tower and Road Warrior Stories, published in 2013. Here’s an extract from the book, telling of my experience in Huawei’s factory back in 2001. My first visit to China was to Beijing in 1995 to attend a conference and, apart from an excursion to Mutianyu to visit the Great Wall of China, not much happened at the conference. But on the Wall, Chinese teenagers were anxious to engage me in conversation just to practice their English. “Good day.” “How are you?” “Are you from America?” “Do you like Manchester United?” And such like. 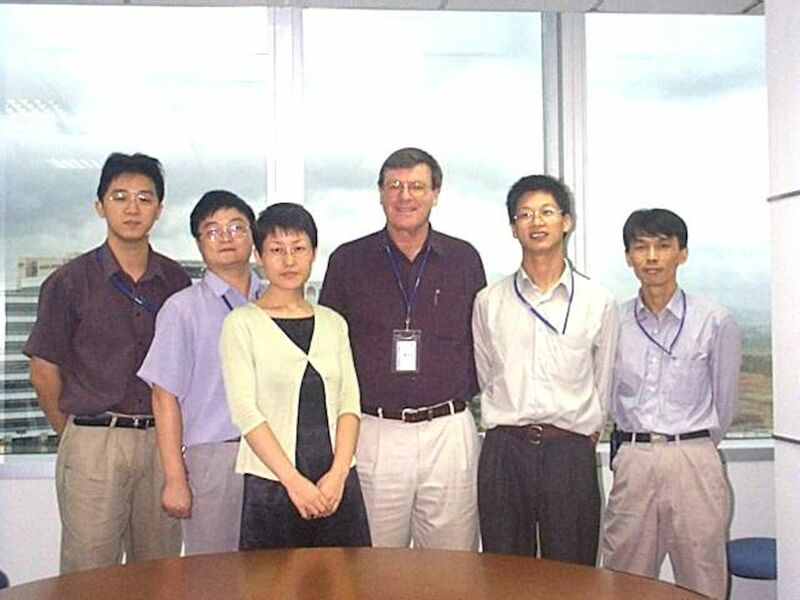 My second time in China was in 2001 when I visited the Chinese telecommunications giant, Huawei Technologies, in Shenzhen in southern China’s Guangdong Province. I was there for a week, flying over from San Francisco where I’d already spent a week teaching a five-day class to Cisco in Silicon Valley. This was the only time I did a full round-the-world trip: London – Atlantic Ocean/North America – San Francisco – Pacific Ocean – Hong Kong – Shenzhen – Hong Kong – overland flight back to London. The week in Shenzhen was exhausting. The Huawei designers pumped me hard to find out what their American and European competitors – Cisco, Nokia, Ericsson, Lucent, and Alcatel (all customers of mine) – did for DFT. I had to keep repeating that I was bound by non-disclosure agreements with each of these companies and could speak only about things that they had published in the open literature. I thought it odd that they should expect me to reveal all. When I went into the company on the first day, all the open USB and Ethernet ports on my laptop were sealed with a sticky silver tape by Huawei’s security personnel. I was warned that if I removed the tape, the security people would wipe clean (reformat) the hard drive of my laptop. I was also told that even if I temporarily removed the tape and then put it back, it would turn black within minutes and the security personnel would know that I had exposed a port. This was all done to prevent me copying any Huawei company information onto my hard drive. In the event, I presented my PowerPoint presentations from a Huawei desktop computer using backup copies of my files that I carried on a memory stick. I even had to get a special ruling to take and use the memory stick inside the company! At the end of the week in Shenzhen and after two weeks on the road, I was ready to go home. I’d had enough of China and, on the Friday evening, I made my way back to Hong Kong by train, arriving around 7 PM. I had a 10 AM British Airways flight the following morning back to London. I was tired and in need of some serious relaxation. I stayed the night at the excellent Regal Airport hotel right in the airport at Hong Kong’s new Chep Lap Kok international airport. I checked into my room and for the first time in two weeks, relaxed. I raided the mini-bar, finding and rapidly consuming two small bottles of wine contained therein – one white, one red. Then I ordered room service and two more bottles of wine to replenish the mini-bar. I consumed those two bottles as well. When I checked out the following morning, I noticed that I had been charged for two bottles of wine, not four, and being an honest sort of guy, I pointed out that I had drunk the replacement wines brought up with my room-service meal. The check-out assistant, a beautiful-looking Chinese girl, looked me straight in the eye and said, “Sir, it is not possible to drink four of these bottles in one evening. If you had, you would not be standing here at 7 AM.” And with that, she proceeded to charge me for just two bottles and signed off my account. I fell instantly in love with her! So, there you have it. It’s all because of me. It’s all because I taught the Huawei designers how to design high-quality testable products and clearly they listened, absorbed, and implemented the techniques. Little did I know at the time that I would be directly responsible for embargoes on products with secret hardware back doors via the DFT logic, and indirectly responsible for a trade war and for the detention of a high-profile Huaweinne at Vancouver airport. I’d best be careful if I travel to anywhere via Vancouver airport in the future. Now I know why the stock market and our investments have taken a tumble!